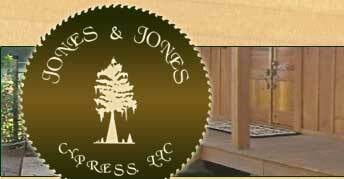 Jones and Jones Cypress is a small two man sawmill operation located in Batchelor, Louisiana and is owned and operated by the father/son team of Roger and Chad Jones. In their original occupations of carpenter/cabinet builders, finding good lumber to build their orders became harder and harder to find, which prompted them to buy a sawmill in 1999. Since then, the cypress sawmill business has flourished into a full time operation. The primary goal of Jones and Jones Cypress is to produce beautiful cypress post and beams up to 26 feet long for new or existing homes and businesses. Jones and Jones Cypress utilizes a computer controlled sawmill setworks to provide accurate cuts in lumber and beams. This technology gives their cypress customers exactly what they order. Roger and Chad take pride in keeping a clean and organized operation while keeping the highest quality cypress products at the lowest prices. For your next project, let Jones and Jones Cypress serve you. We are large enough to supply your needs, yet small enough to provide you with the personal service you expect.